ETC will be participating in the Four Corners Oil and Gas Conference on May 11th and 12th, 2016 in Farmington, NM. Stop by booth 521 to check out our brand new Iris Wireless Bridge and find out why this exciting new product is already in high demand! 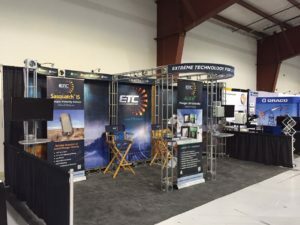 We will also be demonstrating our new Sasquatch plunger velocity sensor with ETC Vision, and have our ALiEn2 plunger lift controller, Cyclops IS & ExP plunger arrival sensors, and the PC180 Chemical Management System on display. Our Channel Sales Manager, Shane Soum, will be present in the booth throughout the show to answer all your questions, and our President & CEO, Mark Scantlebury, will be delivering two presentations during the conference. On Wednesday, May 11th at 2:00 pm in Room 2 , Mark will be presenting some exciting new information on Plunger Velocity Average versus Surface. On Thursday, May 12th at 10:00 am in Room 2 Mark will continue the conversation with a presentation on Using Plunger Surface Velocity to Increase Safety and Production. For the complete conference schedule, click here.